Edited for OOPS forgot to put the root/startup file in. Forgot to thank scOttman for his jwmbackground changer for it was the pattern I used to make those little programs. I have been trying to get the system sounds that I use in MyWolfe to where you could change them easily with a grafic user program will I did it and now want to share it you all. 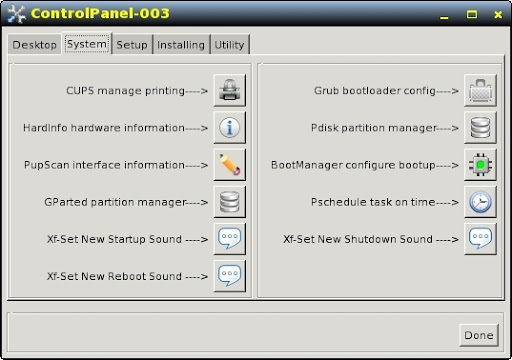 It is very important that before you install the System Sound program that you backup your wmreboot and wmshutdown files that are in /usr/bin, for those will be over written by the program. So be safe and backup before installing. This will also work with Puppylinux-4.3.1 for I have installed and use it. Keep in mind those do not have a menu enter because in MyWolfe they are on the topbar and do not need it. That being said here is the links to them.